Designed to transport all your kit with ease use the Puma Pro Training II Medium Wheel Bag in Black for training and match days. 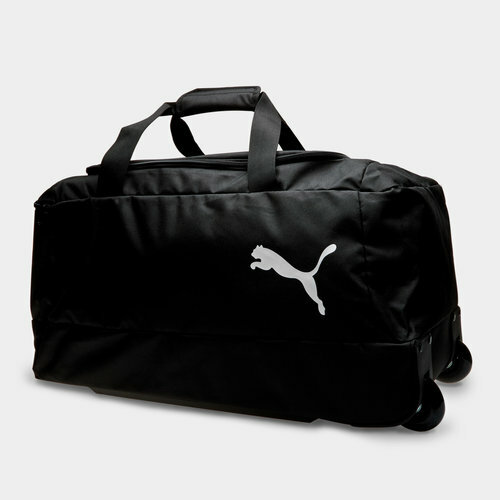 If you need to travel far for training or match days then this Puma wheel bag is the perfect bag. This spacious bag has a large main compartment and a zip compartment on the side panel to help you organise and store your valuables. This bag has been constructed with wheels and an adjustable handle to make transportation more efficient. It is made with a reinforced bottom for added protection and durability. If you wanted to carry the bag instead of wheel it there are dual connectable carry handles.